1 of 4 Place oil, passion fruit puree, lime juice, vinegar, sugar and salt in the bowl of a blender. Blend until well combined. Stir in shallot and parsley and set aside. 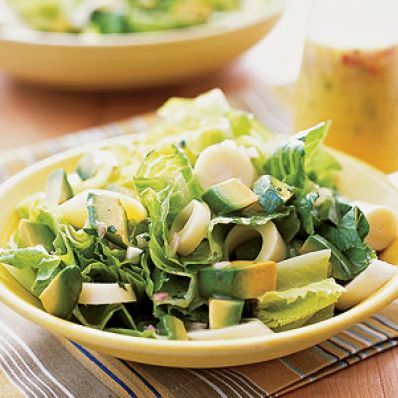 2 of 4 In a large salad bowl, mix the lettuce and hearts of palm. 3 of 4 Cut avocados in half, remove the pit and score the flesh into cubes with a knife. Scoop the avocados out with a spoon and add to the salad bowl. 4 of 4 Drizzle the dressing over the salad and toss gently. Finish with some fresh cracked black pepper, if desired. Per Serving: 3 g sat. fat, 29 g Fat, total, 5 g fiber, 278 mg sodium, 4 g pro., 14 g carb., 0 mg chol., 313 kcal cal.